1. We're talking about women in translation this month because, out of the already tiny number of books that are translated into English each year, only 30% are written by women! Why do you think so few books by women are being translated? Speaking from my position in the world of francophone Caribbean letters, I can only surmise that the relative dearth of translated books by women reflects the relative dearth of published books by women in their original language. The reasons for this are complex, but might be said to boil down to a sort of suspicion that somehow "women's issues" are limited and particular, whereas what men write has broader purchase (and I use the word "purchase" intentionally - to point to questions of marketability and of capital that surround the global literay institution). And if you add the matter of race to the presumed specificity--and attendant unmarketability--of gendered perspectives, things get even more "challenging," shall we say. 2. 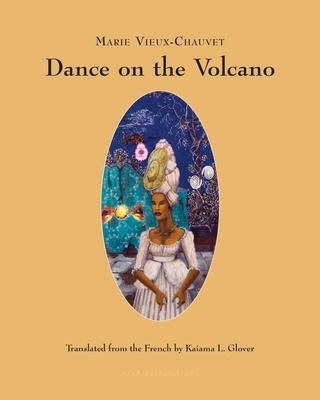 In addition to your new translation of Marie Vieux-Chauvet's Dance on the Volcano, you also edited a volume about her, Revisiting Marie Vieux-Chauvet: Paradoxes of the Postcolonial Feminine. What drew you to her work? And how did you come to translate Dance on the Volcano? My interest in Chauvet has a lot to do with what I've said about the presumed limitedness and subsequent sidelining of women writers. Chauvet was writing during some of the most explosive years in Haitian history - a period during which to write was in and of itself a supreme act of bravery. That Chauvet was writing then, there, and about things like racial politics, violence, and class conflict is nothing short of incredible. The whole of her corpus is fascinating to me, and Dance on the Volcano is a particularly significant work. To start with, it's one of less than a handful of novels written by a Haitian author on the Haitian Revolution. But it also does the incredible work of rendering the complexity and drama of that powder-keg episode in the late-eighteenth and early-nineteenth century relevant and resonant in the contemporary moment. She homes in on the ambivalences of internecine struggle and the difficulty of grappling with the construct of race in ways that make Dance on the Volcano something of a cautionary tale for our ostensibly postcolonial, desperately "post-racial" present. But I have to admit, intially Dance on the Volcano wasn't my favorite of Chauvet's novels. In the process of so intimately engaging with it through translation I truly have come to appreciate it as a masterpiece, but the credit for making it available in English belongs entirely to Jill Schoolman, founder and editor of Archipelago Books. Anyone in the "translation game" knows Jill and knows how discerning and provocative her instinct is when it comes to choosing works for translation. She approached me with the project and I didn't hesitate for a second to trust her judgment of the novel and its importance. 3. As a scholar and translator, it seems like you wear many different hats; we're interested in your work as a founding co-editor of sx archipelagos. What is the Small Axe Project, and what led you to create sx archipelagos? The Small Axe Project is a a consortium of four platforms, one analog and three digital, comprising the print journal Small Axe and the online publications sx salon, sx visualities, and sx archipelagos. Its aim is to explore, query, promote, and otherwise engage with the literature and culture of the Caribbean and its diasporas. We work with scholars, artists, and other cultural actors to think deeply about the geo-cultural space of the Americas as a region as well as with respect to the wider world. My co-editor Alex Gil and I launched sx archipelagos just last year. Its specfic mandate is to provide space for peer-reviewed digital scholarship or scholarship of the digital in, about, or emerging from the Caribbean. 4. We read a lot of literature in translation at Book Culture, which means we spend a lot of time thinking about what hasn't been translated. Tell us about what we're missing: who are some of the great female writers who should be translated, but haven't yet? Is there anyone you'd especially like to translate? 5. Now for some recommendations! What should we be reading this Women in Translation Month? Aside from Chauvet's Dance on the Volcano and her extraordinary trilogy Love, Anger, Madness, Mauritian author Ananda Devi's Eve Out of Her Ruins is a fantastic book and a beautiful translation. 6. Can you tell us about what else you're working on? Do you have any more translations in the works that we can look forward to? I've got my professor's hat on in earnest at the moment. I'm completing a manuscript titled "Disorderly Women: On Caribbean Community and the Ethics of Self-Regard" - the title pretty much sums it up! As to translating, Jill says she'd be up for publishing more Chauvet in English, and that prospect appeals to me enormously. Don't miss our Women in Translation Month staff picks or our Q&A with author Lina Meruane! Kaiama L. Glover is Associate Professor of French and Africana Studies at Barnard College, Columbia University. She is the author of Haiti Unbound: A Spiralist Challenge to the Postcolonial Canon (Liverpool UP 2010) and co-editor of several books and special issues of journals, including Revisiting Marie Vieux Chauvet: Paradoxes of the Postcolonial Feminine, an issue of Yale French Studies. She has translated three works of Haitian literature, Chauvet’s Dance on the Volcano (2016) and Frankétienne's Ready to Burst (2014), both with Archipelago Books, and René Depestre's Hadriana in All My Dreams (Akashic Books 2017). She is the winner of fellowships and awards from the PEN/Heim Foundation, the Fulbright Foundation, the Mellon Foundation, the National Endowment for the Humanities, and the National Endownment for the Arts.